In May 2016, Microsoft announced its intent to remove the controversial Wi-Fi Sense feature from Windows 10. Up-to-date versions of Windows 10 no longer support this capability. The content, below, pre-dates Microsoft's feature deprecation; we maintain it on behalf of people who rely on older versions of Windows 10 (e.g., in settings where device upgrades are managed by others). No alternative Wi-Fi-sharing technology is baked into Windows 10 as of version 1809, released in the autumn of 2018. Microsoft added an interesting new feature in Windows 10 called Wi-Fi Sense that lets you silently share Wi-Fi passwords with your friends. Previously a Windows Phone-only feature, Wi-Fi Sense uploads your passwords to a Microsoft server and then distributes them to your friends. The next time they come within range of that network, their devices will connect automatically with no need to worry about passwords. It's an incredibly convenient way to share Wi-Fi network passwords if you find yourself doing that far too often. But it does come with some problems you should be aware of. Wi-Fi Sense should be on by default on your Windows 10 PC, but to check that it's active click on the Start button and then select Settings. Go to Network & Internet > Wi-Fi > Manage Wi-Fi settings. Now you're on the Wi-Fi Sense screen. At the top are two slider buttons that you can turn on or off. The first one labeled Connect to suggested open hotspots, allows you to connect automatically to public Wi-Fi hotspots. These hotspots come from a crowd-sourced database managed by Microsoft. That's a helpful feature if you travel a lot, but it's not related to the feature that lets you share login authentication with friends. The second slider labeled Connect to networks shared by my contacts is what allows you to share with friends. After you turn that on, you can choose from three networks of friends to share with including your Outlook.com contacts, Skype, and Facebook. You can choose all three or just one or two of them. Before you can receive any shared Wi-Fi networks from your friends, you first have to share a Wi-Fi network with them. Wi-Fi Sense is not an automated service: It is opt-in in the sense that you have to elect to share a Wi-Fi network with your friends. The Wi-Fi network passwords your PC knows will not be automatically shared with others. In fact, you can only share Wi-Fi passwords using consumer-grade technology — any corporate WI-Fi networks with extra authentication cannot be shared. After you do share a network login, however, any networks shared by your friends will be available to you. Staying on the screen at Settings > Network & Internet > Wi-Fi > Manage Wi-Fi settings, scroll down to the sub-heading Manage known networks. Click on any of your networks listed here with a Not shared tag and you'll see a Share button. Select that and you'll be asked to enter the network password for that Wi-Fi access point to confirm you know it. When that step is done, you'll have shared your first network and are now able to receive shared networks from others. So far we've said you're sharing your Wi-Fi password with others. That was mostly for the sake of clarity and simplicity. More precisely, your password is uploaded to a Microsoft server over an encrypted connection. It is then stored by Microsoft in an encrypted form and sent to your friends back over an encrypted connection. That password is then used in the background on your friends' PCs to connect to the shared network. Unless you have friends who have some serious hacking chops they will never see the actual password. In some ways, Wi-Fi Sense is more secure than passing around a piece of paper to house guests since they never get to actually see or write down your password. However, to be of any use, your guests first have to be using Windows 10 and already sharing Wi-Fi networks through Wi-Fi Sense themselves. If they're not, Wi-Fi Sense will not help you. That said, don't think that you'll be able to just turn on this feature and start using it on the spur of the moment. Microsoft says it takes a few days before your contacts will see shared networks on their PC. If you want to coordinate some Wi-Fi Sense sharing make sure you do it ahead of time. Wi-Fi Sense sharing only works if you know the password. Any networks you share with your friends via Wi-Fi Sense cannot be passed on to others. 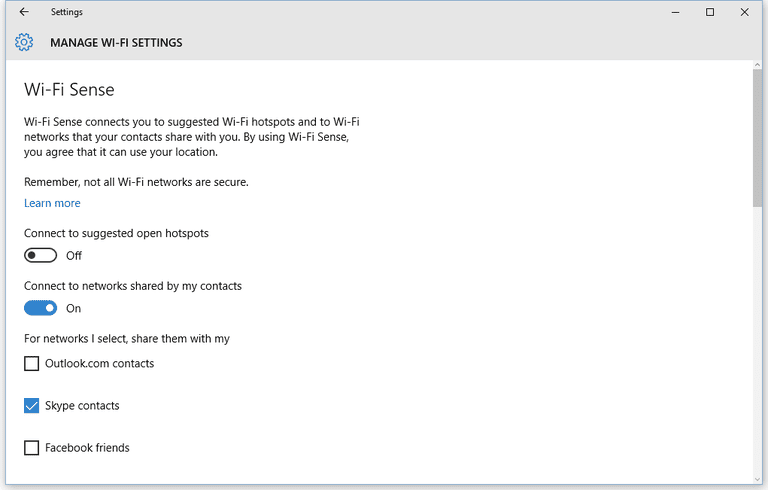 Wi-Fi Sense requires some very specific actions before it will be of any use, but if you have a group of friends that need to share network passwords Wi-Fi Sense can be a helpful tool — as long as you don't mind letting Microsoft manage your Wi-Fi passwords.